The optimistic predictions that national and local economic and real estate experts made last year about Jacksonville are falling into line with reality. Jacksonville’s economy is booming! It’s good news for everyone in the area, since new jobs, more tourism and rising home values benefit the whole community. The city is the largest in Florida whose economy is anchored by the naval bases in Jacksonville, the third largest military installation in the U.S. Other large employers call Jacksonville home, like CSX Corporation, Landstar System, Southeastern Grocery, and the Sally Corporation. Recent gains in construction, manufacturing, professional services and tourism have dropped the unemployment rate in the second quarter of 2017 to four percent. Annual job growth rose at 4.3 percent, making it one of the top job growth markets in the U.S. The presence of the naval stations gives the area considerable economic stability, and they serve as Jacksonville’s largest employer. Florida has long been a tourist destination, and the waterways and beaches of Jacksonville place it among the top in the state. It has the largest urban park system in the U.S. The natural beauty of Jacksonville and its eco-tourism opportunities, along with its youthful cultural and art scene, drive visitors to this city. During the 2016 tourist season, Florida experienced a slowing occupancy growth rate of just 0.3 percent, while Duvall County experienced a 1.7 percent growth rate. The increase in Jacksonville started in 2015, when it outranked Florida’s tourist heavyweights like Orlando, Miami and Tampa-St. Petersburg for tourism. That impressive increase in job growth led to an influx of new residents into JAX from 2015 to 2016. According to Forbes Magazine, the metro area has experienced a 5.1 percent population increase over the last three years. Economist Sean Snaith of the University of Central Florida estimates that all cities in Florida will see strong population and job growth, pushing the state’s economy over the $1 trillion mark by 2018. Time reported that Jacksonville ranks 17th in the nation for growth in millennial households. The increases in population and jobs in JAX have put upward pressure on home prices. The Florida Board of Realtors reported that the median sales price for a single family home in the Jacksonville metro area was $236,900 in the first half of 2017, up seven percent from the previous year. Attached home selling prices $155,000, up 7.6 percent. Even though prices were up across the board, so were sales. They increased 3.8 for detached and 2.1 percent for attached. 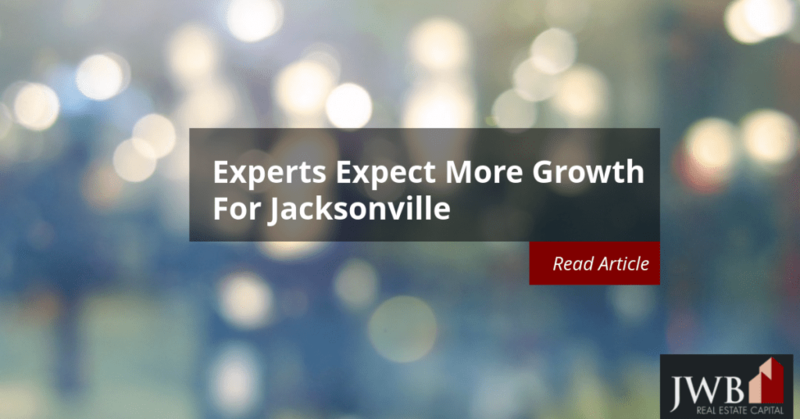 Clear Capital, a leading real estate data provider and appraisal service, reported that Jacksonville saw price increases of two percent quarter over quarter. They expect JAX to become the fastest growing housing market in the country. New home construction activity is another measure of the strength of the demand for homes in Jacksonville. The U.S. Census Bureau collects building permit data and reported that 8,499 single-family permits were issued in 2016 for the metro area. During the first half of 2017, new single-family permits totaled 5,118. The major indicators point to robust demand for housing in Jacksonville as a result of job growth. Since the upswing in employment, the increased demand is evident in rising home values and the higher volume of building permit activity. Jobs are the foundation of the Jacksonville economy, and strong rates of migration strengthen the rental market. Newcomers are more likely to rent before they buy, and with the upward pressure on pricing for homes, the demand for rentals will likely increase from existing households, as well.